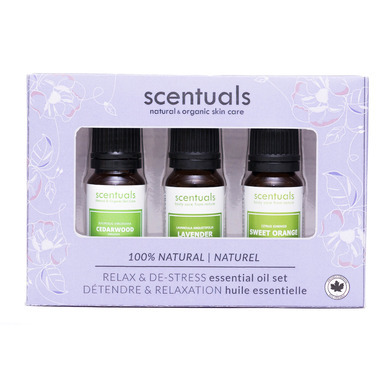 The Perfect blend of 100% Pure Essential Oils to Relax and Destress mind & body. Lavender oil is distilled from the lavender flower. This rich floral essential oil is used to ease anxiety and aid in relieving insomnia. Sweet Orange is cold expressed from the peel of oranges. This pleasant, fruity scent essential oil is ideal for easing sore muscles and uplifting spirits. Cedarwood oil is extracted from wood pieces. This fresh woody pine essential oil is used to reduce inflammation and improve focus. Dilute in carrier oils like Scentuals' Organic Argan, Tamanu and Vitamin E, or water. Add to unscented cleaning products or water and spray on linens. Add to unscented beauty and skin care products, Scentuals Scentfree Collection is the perfect canvas for creating your own personal scent blend.